You can reach Venice and use the water bus. The Marco Polo airport lies at 12 km by land and 10 km by water from Venice. It is well connected with public means of transport (by water and land) to Venice and also to the Mestre train station. The airport of Tessera is well connected to Venice (Piazzale Roma) by land with the public bus of the lines ACTV and ATVO. The ticket is valid for 60 minutes for all the urban lines of Mestre and Lido, not valid for journey there and back. If you buy a group of 10 ticket, you have to take always with you also the main ticket that is in the last page of the group. You can buy the ticket in the shops that have an agreement with the ACTV, or at the office and shops in Piazzale Roma and Lido. The bus reaches Piazzale Roma in about 30 minutes. As you reach Piazzale Roma you can take both the public water bus or a private water taxi. The airport of Tessera is connected with Venice by a motor-boat service and private taxi service. Alilaguna is the connecting line by water between the historic centre of Venice and the airport Marco Polo, sailing along a picturesque itinerary in the North of the Lagoon. 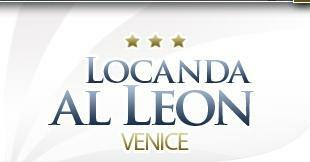 The cost of the ticket, which you can buy directly on board without any additional cost, is 8,78 euro AIRPORT-VENICE (SAN MARCO). As you reach S. Marco the Hotel Al Leon is easily and quick reachable on foot. Venice is connected to the land by two bridges, one is the bridge for the trains and the other if for the cars. The train station Santa Lucia of Venice is situated in the district of Cannaregio, near Piazzale Roma, the car terminal. The main lines that connect Piazzale Roma to S.Zaccaria, where there is the hotel, are line 1, 51, 52, 82 and N (night service). From Tronchetto line 82 and N.
You have to get off at the stop San Zacaria. As you reach this stop you can easily reach the hotel on foot in a few minutes. Easily reachable from the city on foot or by water bus.